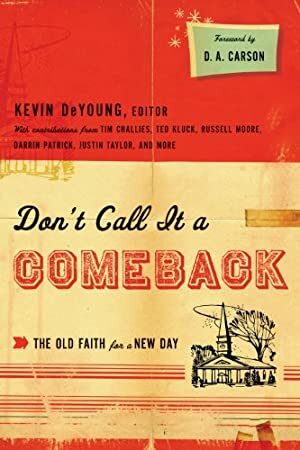 DeYoung and other key twenty- and thirty-something evangelical Christian leaders present Don't Call It a Comeback: The Same Evangelical Faith for a New Day to assert the stability, relevance, and necessity of Christian orthodoxy today. This book introduces young, new, and under-discipled Christians to the most essential and basic issues of faith in general and of evangelicalism in particular. Kevin DeYoung and contributors like Russell Moore, Darrin Patrick, Justin Taylor, Thabiti Anyabwile, and Tim Challies examine what evangelical Christianity is and does within the broad categories of history, theology, and practice. They demonstrate that evangelicalism is still biblically and historically rooted and remains the same framework for faith that we need today. Log In to track Andrew David Naselli on eReaderIQ. to be notified each time the price drops on any book by Andrew David Naselli. to stop tracking Andrew David Naselli. Log In to track Ben Peays on eReaderIQ. to be notified each time the price drops on any book by Ben Peays. to stop tracking Ben Peays. Log In to track Collin Hansen on eReaderIQ. to be notified each time the price drops on any book by Collin Hansen. to stop tracking Collin Hansen. Log In to track David Mathis on eReaderIQ. to be notified each time the price drops on any book by David Mathis. to stop tracking David Mathis. Log In to track Denny Burk on eReaderIQ. to be notified each time the price drops on any book by Denny Burk. to stop tracking Denny Burk. Log In to track Eric C. Redmond on eReaderIQ. to be notified each time the price drops on any book by Eric C. Redmond. to stop tracking Eric C. Redmond. Log In to track Greg Gilbert on eReaderIQ. to be notified each time the price drops on any book by Greg Gilbert. to stop tracking Greg Gilbert. Log In to track Jay Harvey on eReaderIQ. to be notified each time the price drops on any book by Jay Harvey. to stop tracking Jay Harvey. Log In to track Jonathan Leeman on eReaderIQ. to be notified each time the price drops on any book by Jonathan Leeman. to stop tracking Jonathan Leeman. Log In to track Justin Taylor on eReaderIQ. to be notified each time the price drops on any book by Justin Taylor. to stop tracking Justin Taylor. Log In to track Owen Strachan on eReaderIQ. to be notified each time the price drops on any book by Owen Strachan. to stop tracking Owen Strachan. Log In to track Russell Moore on eReaderIQ. to be notified each time the price drops on any book by Russell Moore. to stop tracking Russell Moore. Log In to track Ted Kluck on eReaderIQ. to be notified each time the price drops on any book by Ted Kluck. to stop tracking Ted Kluck. Log In to track Thabiti M. Anyabwile on eReaderIQ. to be notified each time the price drops on any book by Thabiti M. Anyabwile. to stop tracking Thabiti M. Anyabwile. Log In to track Tim Challies on eReaderIQ. to be notified each time the price drops on any book by Tim Challies. to stop tracking Tim Challies. Log In to track D. A. Carson on eReaderIQ. to be notified each time the price drops on any book by D. A. Carson. to stop tracking D. A. Carson. We started tracking this book on January 24, 2011. The price of this book has changed 72 times in the past 3,013 days. The current price of this book is $9.97 last checked one day ago. This lowest price this book has been offered at in the past 90 days is $5.68. The lowest price to date was $1.99 last reached on August 27, 2013. The highest price to date was $13.25 last reached on December 5, 2017. This book has been $13.25 one time since we started tracking it. We last verified the price of this book about one day ago. At that time, the price was $9.97. This price is subject to change. The price displayed on the Amazon.com website at the time of purchase is the price you will pay for this book. Please confirm the price before making any purchases.